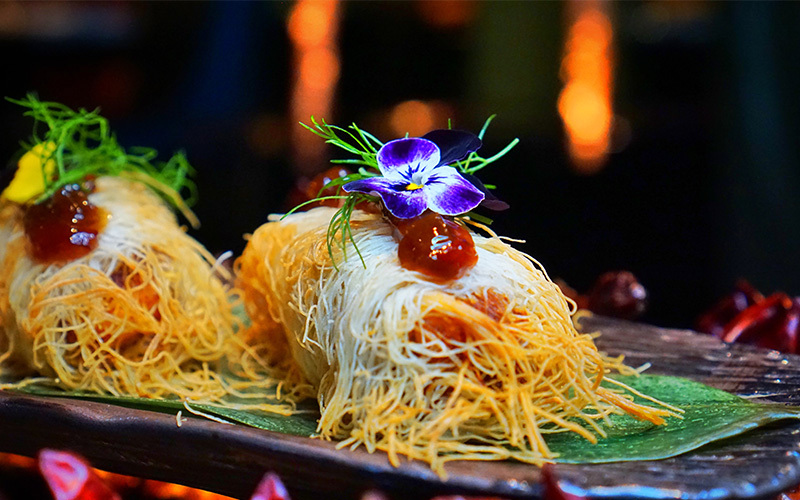 Season 5 has arrived at Carnival by Tresind, and this time both kitchen and restaurant explore culinary delights and influence from Colonial India – not forgetting a side of playful theatrics that the restaurant is so well known for. The front of house team is dressed in Vasco De Gama-inspired sailor outfits, while tables are lined with imagery from the colonial days, where the British, Portuguese, French and Dutch inhabited India and influenced the creation of Anglo-Indian cuisine, which combines Indian ingredients with European cooking methods. Especially for the new season, Carnival by Tresind has welcomed a real thela (food cart) from India to an area of the restaurant to create a street food vibe. The cart has been turned into a ‘chaat tanga’ – a trolley that serves various styles of chaat. You’ll find four types on offer: taco padi chaat, nitro bhel puri, pani puri rasgulla and ghugni chaat – all of which are incredibly tasty. It’s easy to do (as I learnt), but try not to fill up too much at this station, as so much more food will follow. In the street food corner, there’s also a couple of drink stations, where you can sample refreshing, carbonated beverages reminiscent of those served on hot summer days in Kolkata. The culinary adventure continues seated at the table, where ‘chicken soup for the soul’ is served. This dish of butter chicken consommé with chicken bread goes down a treat, before the next dish of tasty masala fried chicken kurkure, which reminds me of a batter-fried Chinese chicken dishes. South Indian ginger prawns follow that boast a thick yet crispy brown sugar caramel coating – it’s a rich, incredibly Moorish dish that’s kept light by its small serving and a curry leaf crisp. You really feel the European influence come through with the next dish of double roti dahi kebab, which is plated with walnut, goat’s cheese, rocket, olive oil and a beautiful tamarind chutney. Believe it or not, main courses are up next. Starting with tender, fall-off-the-bone babecued lamb ribs with crushed baby potatoes, which is served tableside. Hearty curry dishes follow, including an incredible, French-inspired coq au vin chicken masala, and a perfectly cooked pondicherry fish curry with a slightly spicier kick. My only regret with this course is that I wish I’d had a little more self-control at the chaat trolley, because the curries were absolutley delicious and I struggled to eat more than a couple of spoonful’s – thankfully, my husband on the other hand had no issues! To finish, the caramelised apple tart is a must. Served warm with hazelnut barfi filling and topped with ice cream, the tart’s crumbly pie crust in buttery and ensures the meal is rounded off perfectly. The team at Carnival by Tresind are attentive and very well versed on the menu. They’re always on hand to ensure you understand all components of a dish and that a great time is had by all. The playful younger sibling of Tresind at Nassima Royal Hotel, Carnival by Tresind boats all the necessary components for an interactive and entertaining dining experience with flavour-packed food and enjoyable, fun surprises along the way. Details: Priced at AED 375 for the chef’s 10-course tasting menu, per person excluding beverages. Call +971 4 4218665 / +971 52 242 4262, e-mail carnival@passionfandb.com or visit carnivalbytresind.com to make a booking. If you liked this review, you might be interested in reading this review of an Indian lunch experience in Dubai.